The sun was still trying hard to stay away from the specs of dark clouds that had started to surround it, threatening to ruin an otherwise pleasant Sunday. Even in off-season Florence was its usual bustling self that day, flocked by thousands of people filling up the streets with cameras and selfie-sticks in their hands. I do not blame them, for I had my camera wrapped around my hand as well – and how could I not? Of all the cities that I have had the opportunity to visit till date, Florence stands out as one of the most fascinating and enchanting cities of them all. I had been walking randomly through the narrow winding streets the entire time on Saturday and Sunday was shaping up to be the same. Truth be told, a walk through the old town of Firenze does feel like taking a stroll through chapters of history carved in stone – for the entire city is but a bustling open-air museum reverberating with echoes of the master craftsmen who infused spirit into the walls through their own sweat and creativity. Every turn I took on any random street brought me face to face with some form of art dipped in its own flavor of history – it is almost impossible to run away from being a part of the glittering history of the old town while you are exploring it. I had only just drifted away from Il Duomo di Firenze, this being my fourth visit to the cathedral complex in two days, steering clear of the crowds, only to be led straight into the midst of Piazza della Signoria. 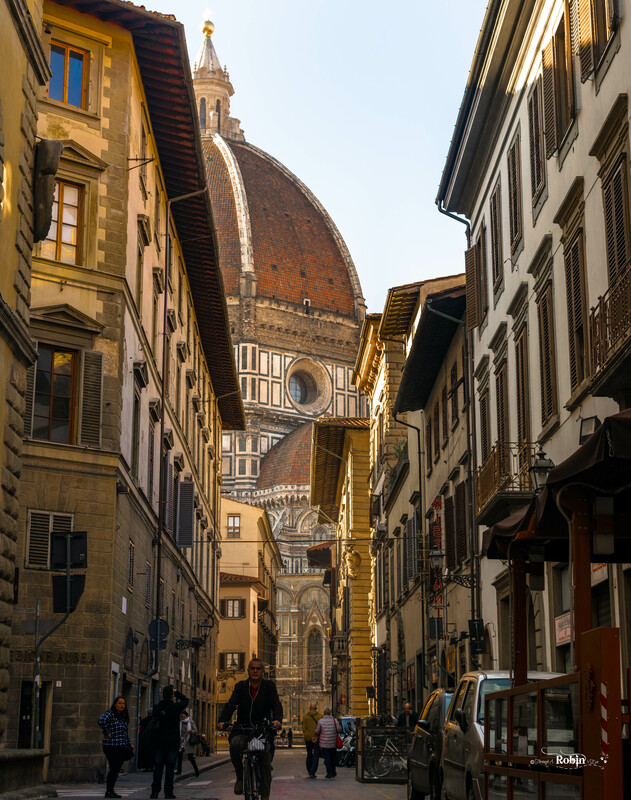 Anybody who has paid a visit to the city square will vouch for the fact that it is, without doubt, one of the most enchanting and confusing part of Florence. While the reason for its enchantment is open for anybody’s to guess, it becomes extremely confusing for the senses to prioritize, serialize and focus on one artifact out of the many masterpiece installations standing majestically in public sight. While everybody around me got busy with pointing their cameras and cell phones in every direction under the sun, I caught a sight through the corner of my eye which had me frozen dead – right in front of the Fountain Of Neptune. If someone were to tell me that the saltiness in the water had increased by a minuscule amount that day, I would not be terribly surprised. Gently tapping the extended stick she had held in her hand, I saw a young woman casually make her way through the crowded piazza. While my first reaction on watching the cheerful lady with the black glasses figuring her way through people was a familiar and instinctive one, I soon felt my feet go numb as soon as she walked past me, sporting a wide smile on her face!! Walking beside her and holding her hand was an elderly lady, gently talking into her ear and turning her by her shoulders towards the artifacts she was explaining about – that’s when I realized the profound beauty of the moment that was passing me by. It struck me really hard that while I, been blessed with all my senses in pretty good shape and a body fit enough to continue my explorations around the world, found it virtually impossible to absorb the complexity and beauty of man-made masterpieces or canvas of nature around me, even with every possible tool at my disposal, there are curious and enthusiastic people around me, differently abled and blessed with their unique sensory wisdom, who are in continuous pursuit of the same happiness and experiences in their own unique ways. I could not help but stand in awe as the elderly lady walked her younger companion around the piazza, explaining to her the minute details inherent in the various body parts of the replica of David at the end of the square – describing its dimension, the level of details of male anatomy captured in the sculpture, etc., and watch the expressions on the face of the young girl change from amazement to sheer bliss. For once I did not know whether to cry for the fact that I have probably not been thankful enough for a fortunate life I have been enjoying, riding the beautiful adventures it has been throwing along my way, or to hold the lady’s hand and thank her for opening my eyes and making me see the true spirit of curiosity and happiness that traveling brings to our lives. Slowly coming back to my senses, I saw them come out of Loggia dei Lanzi and disappear into the crowd, never to be found again. 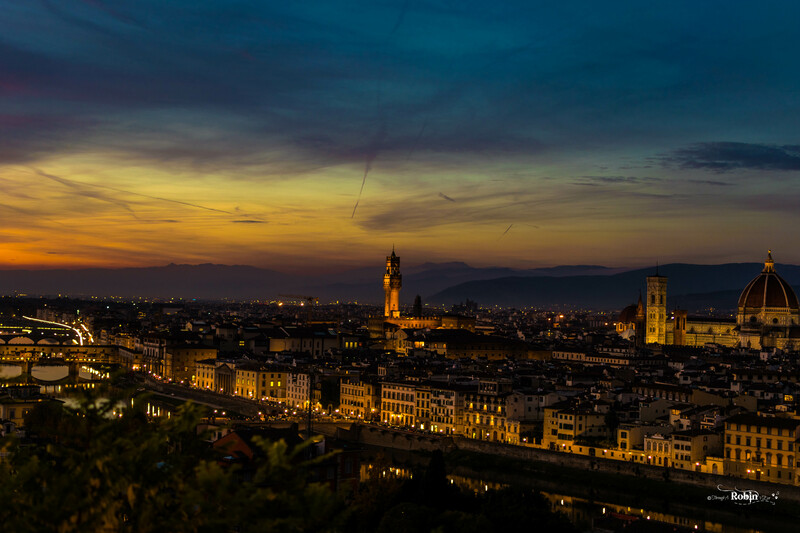 Standing at Piazzale Michelahgelo later that evening and watching the dying sun splash its colors across the medieval cityscape of Firenze I could not help but drift towards the mentioned encounter in the afternoon. The subtleties of these colors, the vibrant hues and its inherent capacity to capture our imagination is one of the most important aspects of our memorable travel experiences – and then we have our brethren travelers who manage to look beyond it and seek travel experiences in ways we can never fathom. So I just closed my eyes for a few moments, felt the cold autumn breeze ruffle my hair and tried to recreate my own little memory of this city. That little encounter at the square has well and truly transformed my approach and outlook towards travel; and life in general. Learning valuable lessons from everything and everyone we cross paths with across unknown geographies – isn’t this what traveling is all about?